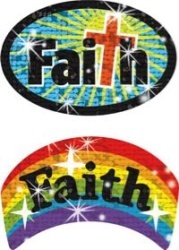 Sparkle Stickers feature a brilliant shine which illuminates these fun, uplifting Christian designs. Use as rewards for good work in classrooms or after-school programs, or as inspiring gifts to brighten anyone's day. 30 to 40 stickers per pack. Sizes vary, but are around 1" wide.